I thought it would be good to share the 3 projects I have been working on for Christmas presents for 3 friends I have had a few difficulties getting them posted as I used my cell phone to take the pics and it has given me a few headaches on how to get them posted with a little explanation with each pic. I have managed it apart from one and Lambie's little write up did not appear. Paris, a photo by Shepherd_Carole on Flickr. 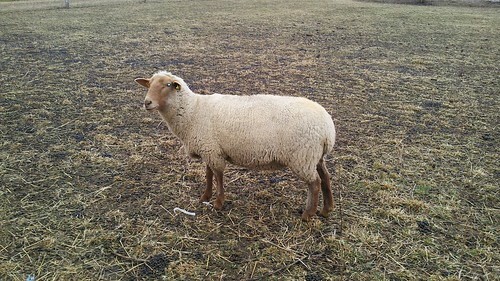 This is Paris she is a Rambouiilet, they have very soft wool and is good for knitting items that are going to be close to the skin. Paris will be nearly 3 yrs old and has had twins twice and we are hoping that she will give birth again in the next couple of months. Scaf3, a photo by Shepherd_Carole on Flickr. 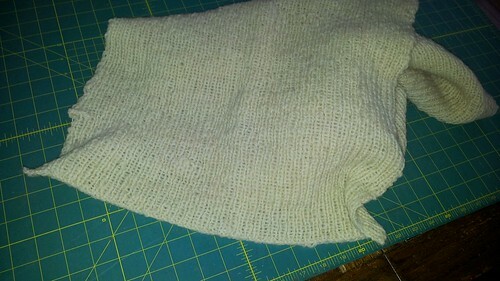 His will be a cowl scarf as you can see I am still working on it. This is knitted out of Rambouillet wool, again I save up enough wool to send to the local mill and they spin it in to yarn for me. I then skein it and dye it, the is hand painted the color is called Regal. Twinie, a photo by Shepherd_Carole on Flickr. 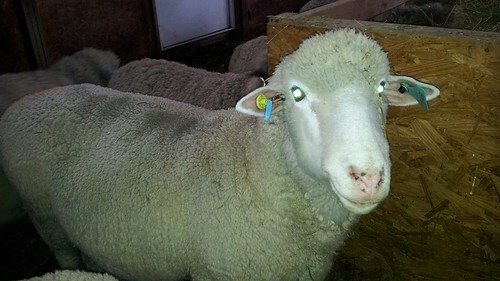 The ewe in the front of the picture is Twinie, with Boobie just behind her they are both Romneys. 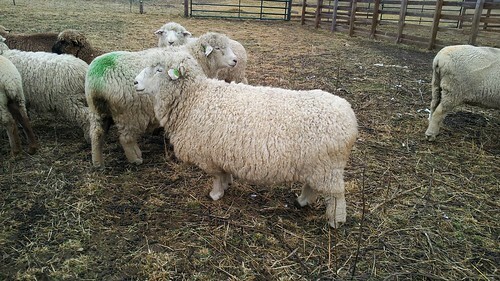 The wool from these white Romney's is sent to the mill to make yarn. The Romney wool is a very hard wearing wool and makes excellent outer wear like hats, gloves, bags etc, example of it knitted is the blue scarf below. 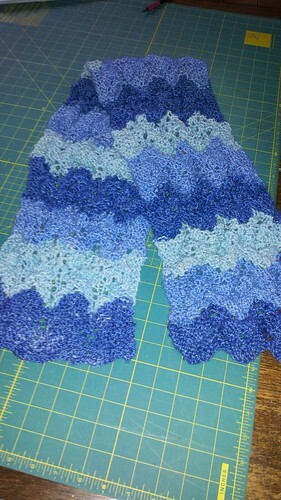 Scarf1, a photo by Shepherd_Carole on Flickr. This scarf is knitted from Romney wool, I wash all my white Romney sheep's wool and then I send it to the local Woolen Mill, there they spin it in to yarn and ship it back to me on cones. 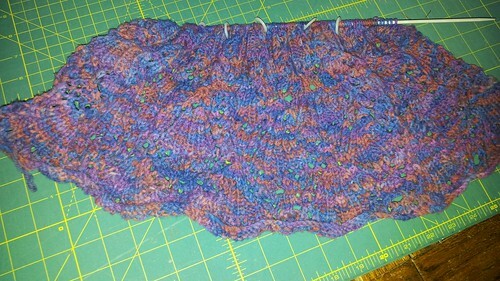 I then skein it in to 200 yds and dye it, the colors I have use here are Royal blue, Copenhagen blue and Baby blue. Lambie, a photo by Shepherd_Carole on Flickr. Zcaf2, a photo by Shepherd_Carole on Flickr. We have had a quite week, last Sunday we took Silver and Boras away from the ewes and ewe lambs and fastened them in the barn with Harry, Bro,Yorkie and little Ben (this years lamb which we are going to keep for breeding stock). When the Rams have been away from each other they have to spend a little bit of time getting to know each other and reestablishing hierarchy. They are now behaving and are ready to be let out in to the ram paddock for the winter. This also means that I have an official date for the end of lambing which will be the 3rd May 20012 and the nice spring weather will be here. I also have had a very sad dog (sam) he had to go to the vets to have his teeth cleaned, he had to have one back mouler removed and he is now taking antibiotics, but he is bouncing back and is arguing with gizmo about chew's. Dave has also got the paypal working on the website and we have had our first order which is great,I am so pleased that it all working.